In inspiring, fresh essays, 20 Unitarian Universalist leaders issue a clarion call for change in the denomination. They show a way forward from an isolated, individualistic “iChurch” to an inclusive, multicultural Beloved Community. Outlining a bold vision for the future of Unitarian Universalism, 20 leaders issue a clarion call for change. In inspiring, fresh essays, they implore us to collectively liberate ourselves from patterns that prevent us from becoming a robust faith for a new age. Emerging from a history marred by the errors of individualism, exceptionalism, and anti-authoritarianism, Unitarian Universalism faces a crossroads. Turning Point shows a way forward, by embracing promises shaped from our theology: generosity, pluralism, and imagination. With essays that include the stories of creative new types of Unitarian Universalist communities across the country, this essential new collection outlines a liberal faith for the twenty-first century. It offers a vision of an inclusive, multicultural Beloved Community and inspires trust that Unitarian Universalism can deepen and grow once again, meeting the aching needs of a new generation. 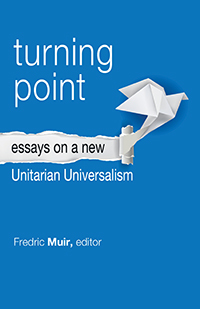 This collection of essays is about the future of Unitarian Universalism, a future to be constructed with the promises shaped by our theology and history, the promises of generosity, pluralism, and imagination. These promises—as promises often are—are a future waiting to be lived and loved. To arrive at this future, we must collectively liberate ourselves from a past that, while bright and bold for some, no longer serves Unitarian Universalism’s dream of being a vibrant, twenty-first-century faith. In fact, this past is replete with errors shaped by individualism, exceptionalism, and a posture of anti-authoritarianism. These errors have become barriers preventing us from embracing our future. "Turning Pointcomes to us at the right time. Its editor and authors offer a refreshing and compelling challenge to make real our commitment to this faith that we cherish. It opens our eyes to exciting new forms of ministry within and outside of the walls of a building, in the community, in the military, and in our global world. It challenges us to create a critical, though often elusive, roadmap to the rich mosaic that is the promise of Unitarian Universalism. "